Are you a fan of the underdog? I love stories of people who overcome obstacles. I’m drawn to the team that comes from nowhere to win it all (Hoosiers is still one of my favorite movies). I am moved by inspirational stories of those that couldn’t or shouldn’t that now have done something fantastic. As I have matured and learned from my own mistakes, failures and successes I find myself more drawn to help develop others as they strive forward in their ventures. One “developmental” opportunity that I am specifically excited about is the upcoming YS 101 Collaborative which launches in April. This is an intentional seven-month coaching collaborative for those newer to youth ministry or in a new role. I love that I am going to team with others to help (what some would see as) underdogs become champions in kingdom work. Though the 101 hasn’t started, I thought I would write a post as if I were talking to a participant and answering the question “what strategic things should I be doing now in March to help with long term ministry success?” Here are three quick tips. If you haven’t already, ALL of your major events for the next six months of ministry should be known by students, leaders and parents. Summer camps, missions or retreat dates should be known by January or February (at the latest). So now, let’s focus on the fall—perhaps you have a fall camp or D-NOW coming in September? Let your ministry people know now what dates they should be reserving and what rate (fee) will be charged. Though you’re still putting the finishing program touches on your spring and are fundraising for summer missions, the fall program is only 6 months away. Have you thought about the incoming class of middle schoolers or high schoolers? Who will be leading those new small groups? It is wise to start recruiting and developing leaders now so that they are prepped and ready for the fresh start in the fall. Do people know the reason why you do what you do? For me, I want lost people to come to know Jesus as Lord. I do youth ministry because ultimately I believe students can and should be the best missionaries the US has ever seen. Your why could be different than mine— If you haven’t already, work your why into your next message, your next email and your next leader training… and then do the same next week, the week after… rinse and repeat. There ya have it: Dates, Develop and Direct, three quick tips for success in your youth ministry game…After all, it is March and for those NCAA hoop fans, March Madness is about to begin and the underdog success stories are about to surface. May yours be one of them. P.S. If you haven’t yet, please check out our 101 Collaborative— I’d love to have you are someone you know as a part of this program. Two onsite retreats, 5 months of online coaching and a FREE registration to the National Youth Workers Convention in Memphis! A can’t miss! I almost got side-swiped while traveling 65mph (okay, more like 70) on the freeway recently. The driver of an F-250 pickup apparently did not see me. Though I was likely in this person’s blindspot, I was able to quickly slow down as he jumped lanes, narrowly avoiding a crash. I probably don’t need to state the obvious, but in the church world we have blindspots as well. And more specifically in the world of church personnel placement I see some obvious blindspots and/or mistakes churches make in the hiring process. By the time a candidate is actually doing an onsite interview he or she has likely answered questions about his or her testimony, strengths, weaknesses and philosophy at least a half-dozen times. Solution: Keep a summary sheet for each candidate and anytime you invite new congregants and decision makers into the process bring them up to speed so you’re garnering new information from the candidates. There is no reason for a telephone “conference call” anymore. The comfort and ease for the search team sitting in the same room is fantastic for the people in the room, but not for the applicant on the other end of the phone. Awkward pauses, questions from faceless voices and laughter for no apparent reason only causes confusion for the candidate. Solution: The internet is your friend. Skype, FaceTime, Zoom, and Webex are all better options than the old-fashioned conference call. When you’ve narrowed to a top 5, get online with your candidates and enjoy some face-to-face internet interaction. The adage is that things never happen fast in a church. But I can tell you that search processes do not have to go in slow motion. Solution: Before you start a search process have an end-date in mind. Outline your meetings in advance. Recruit a team to that plan so that everyone knows how quickly you intend to move. Yes, schedule conflicts will arise, but know that there are only small windows of time that a candidate is looking and once he or she is looking at your church they are often looking at multiple options. Keep moving and keep communicating. Stewardship of kingdom funds is a responsibility we have to take seriously, but so is the stewardship of time and relationships. Whether it is the Senior, Executive or Associate Pastor leading the search process, he or she will either add hours to their schedule or take away time from other pressing matters. The average search will take a church 8-12 months on their own. A church must realize that absence of a leader in a critical staff position may actually lead to people leaving the church as well— this will have financial ramifications. stewardship choice. We already have a network of relationship to tap into. We do this as our full-time focus, giving a significant advantage over a pastor taking time away from his or her regular responsibilities. I would make the case that not using YS Search may be too costly for the church rather than the other way around. Whether you’re changing lanes while driving or making a change in personnel at church, be warned— check your blind spots! A small correction can save you from big mistakes. If you have EVER watched a show on HGTV then you understood the humor— it seems EVERY show on HGTV has this similar storyline. However, I’m still a faithful viewer of these HGTV programs, because I love to see development. I enjoy seeing obstacles overcome. I love transformation. I’m getting so excited about a new venture with Youth Specialties, something that is all about development and transformation. The 101 Collaborative is a seven-month coaching initiative for those new to youth ministry, in a new role or those looking for a refresher in foundational youth ministry skills and strategies. It launches this spring. I believe there are three foundational reasons a newer youth pastor should be a part of this Coaching Collaborative. The program is designed for you to better know yourself (your gifts, motivations, skills and strengths) and know how to better communicate these assets to others. I believe knowledge of self leads to improved boundaries and ultimately helps you understand your part in the body much more (1 Corinthians 12, Romans 12). College and seminaries are excellent, but the actual “doing” of ministry differs from the philosophy you’ve created, adopted or inherited. I’m excited to help our 101 participants take theory into practice and have coaches and peers walk through this together as you contextualize ministry to your own local setting. The “line-up” for 101 includes everything foundational for sustainable long-term ministry success. Youth ministry is relational and the 101 Collaborative will create relational environments where you’ll likely gain life-long friendships and expand your networking abilities. The program itself starts and ends with on-site retreats and then includes monthly online video chat sessions, one-on-one coaching appointments and peer groups. It’s hard to believe it, but April 24-25 and our opening retreat is just a couple months away. The kicker to me is that we are including the National Youth Workers Convention (NYWC Memphis in November) as part of the tuition (arrive one day early for culminating retreat). 3 Ways To Prepare For Your Next Ministry Role NOW – Before There Is Need! Whether it be “Storm Watch 2017” or preparing for “The Big Earthquake” we all know the importance of being prepared ahead of time. If the storm/calamity hits you will be thankful that you were ready. You’ll only regret not doing it if the need arises and you’re not adequately supplied. Similarly as a Youth Pastor/Director the best time for you to prepare for what’s next is when there actually is no need at all! A change in the economy, church leadership, calling or being presented a fantastic new challenge (among many other reasons) may be “the big one” in the life of a Youth Pastor— being prepared in some specific ways before you need to be will help propel you to what’s next. As the Director of YS Search I deal with scores of churches who are looking for new personnel (most commonly Youth Pastors, but also Children’s, Family, Worship, and other roles.). Though there are certainly more, I can say there are three essential ways a person can prepare for a future opportunity before they even know an opportunity is out there. About 25% of the applicants I do interviews with have a video of their teaching, yet nearly 100% of the churches I do placements for require it (though some will settle for audio). Before you NEED to capture a video (because you’ve thrown your name in the hat elsewhere) or before it’s TOO LATE to capture video (because you’ve resigned or been let go) you should prioritize capturing some film. As a general practice I believe it is essential that a youth pastor video him/herself in order to self-assess teaching, style and presentation. Capturing video of yourself when you’re not looking for a job is the best time to do it— you’re the most relaxed, you are teaching/shepherding “your” group and your motivation for capture is truly to improve your skills. Keeping the most pertinent and up-to-date information on your resume will help you if the need ever does arise. Instead of creating a resume out of need (looking to prove your worth) spend a little time each year around the new year updating it (graphically, copy, etc.). Here is a link to a previous blog post I wrote where I talk about specifics of resume writing. I’m an “ENTJ,” “Strategic,” a “high D” and an “Advance” person. Though these may mean nothing to you, these are samples of results from personality assessments I have taken. Not only were these assessments great for my own self-awareness, these have given me language to help better explain who I am and given me insights into my motivations, strengths and possible blindspots. An assessment does not define you (put you in a box), but it may help you (or a current/future employer) better understand some of what makes you tick and I believe it is a great tool to have to help you improve in your current role or an asset to use when discovering whether a future opportunity is a good fit. On a personal note, my favorites have been Strengths Finder and MCore. Capturing video, keeping your resume updated and learning valuable insights through personality assessment will only help to improve your current status, but could very easily pay future dividends when a new opportunity presents itself! The 2016 National Youth Workers Convention has come and gone, fortunately for me I have some pictures that will remind me of some special moments for years to come! Here are a few of those moments and what they represent. Time With Future Youth Leaders! A group of students from Colorado Christian University reached out before the conference to inquire about doing a lunch together. In addition to a great Fajita Salad Elisabeth and I were able to answer the fantastic questions these soon-to-be Youth Pastors asked. The depth and variety of questions gave me great hope for the churches that will someday call these men and women. The YS 101 Track– Ministry Essentials! I was able to curate and lead a new track at NYWC this year, title YS 101. The idea came directly out of our YS Coaching appointments (shout out to our awesome YS Coaches) the last two years. Youth leaders are hungry to get back to the basics of youth ministry. We offered six different 101 seminars (one at each seminar block) and each one was well-attended. Doug Fields, Sean Meade, Heather Flies, Duffy Robbins, Josh Griffin and I each facilitated one of these seminars. What excites me even more is that the 101 Track at NYWC is only the launching point of something much larger happening through YS, a 101 initiative that will offer 101 Training all-year! I got to share about this on Saturday in the Big Room, and I can’t wait to get the word about the 101 Collaborative. Celebrating My Wife’s Birthday with Friends and Rend Collective! One of my favorite text messages came on Sunday afternoon when Elisabeth was at the airport waiting to fly home one-day ahead of me, “I love that we got to do NYWC together; I really like your friends and love that they are becoming my friends too!” Saturday was her birthday and we got to celebrate it in style– by hanging out with Rend Collective and enjoying the way the led nearly 3000 people in worship! Earlier in the day I was honored to do an Idea Lab interview with Chris and Gareth from Rend as well! Most of all I loved, loved, loved having my birthday-bride with me at NYWC! There are so many other things that stood out– like Heather’s message on Sunday, an Idea Lab and hangout time with Tic, time with our coaches, my pre-convention and post-convention time with Fred and of course all the other people I get to hang out with during NYWC! Okay.. I’ll stop… until next year! Thanks for the memories NYWC! Unfortunately, since the English pronunciation of the word “cow” sounds quite similar to the Hindi pronunciation of the word “gaay”, what our audiences heard was, “I’d like to thank you cows for inviting us to come to your country.” It’s important to tailor your message to your audience! And we tried, but breaking American teenagers of the habit of using “guys” proved near impossible! YOU MOVE: There is virtually nothing static about a middle school student. There shouldn’t be anything static about your talk. Make sure that you are moving as you communicate with middle schoolers. Walk forward toward your audience, or from one side of the stage to the other; kneel or sit down to draw your audience’s attention to a new place on the stage; extend your arms to make a point. Movement doesn’t need to be unnatural in any way, and shouldn’t distract from your message. Done well, movement on the part of the speaker can help keep your middle school audience connected and focused. THEY MOVE: Along the same lines, getting your audience to move in some form or fashion is effective as well. I may throw in a quick question with instructions to “stand up if you’ve ever _____” or ask the audience for a round of applause after a student has shared (clapping acts as a stimulus). Middle schoolers need to move. Giving them opportunity to do so within the context of listening can actually refocus and refine their attention. BE MOVING: Be passionate about your subject. Middle school students want to hear your story as it relates to THE story (of God). As you share from the Scripture, make sure you talk about how God is transforming you. There is a fine line between being moving and seeking to manipulate… be truthful, be honest, but invite students to see the active movement of God in your life. INVITE THEM TO A MOVEMENT: I believe the best way to put an exclamation mark on a good middle school message is to invite a student to action (movement). Give them something simple, practical and doable. Sometime this movement can be specific, like an invitation to “come to this service project,” but I believe the most effective movements are the ones the students initiate, after being inspired and invited to dream and to do! As you get to know your audience, take some new risks in your talks. Put these four movements into action. Just don’t call them cows! 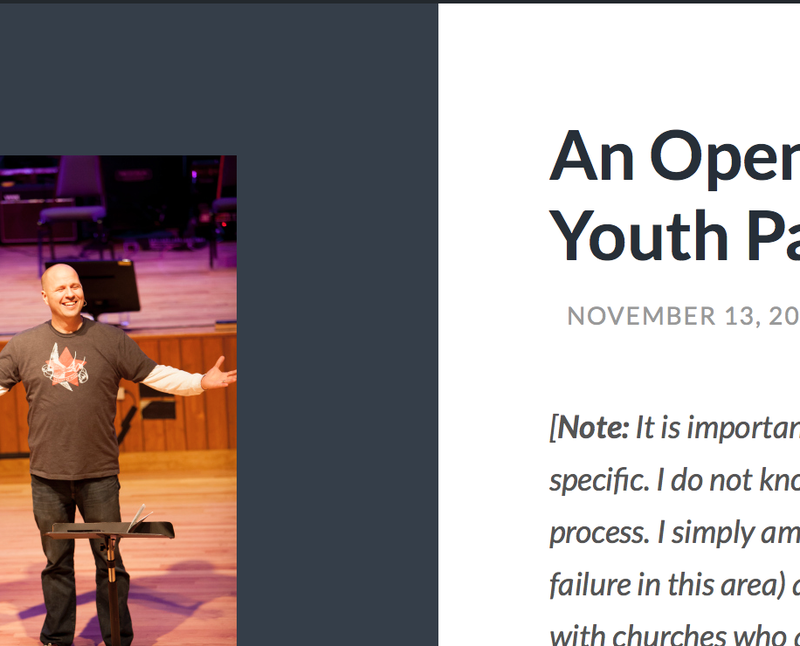 A few years ago I wrote “An Open Letter to The Departing Youth Pastor” that became my most read blogpost ever. Because of that and the sheer volume of conversations I have about the subject of change in ministry, I decided to pitch a seminar to Youth Specialties a couple years ago. 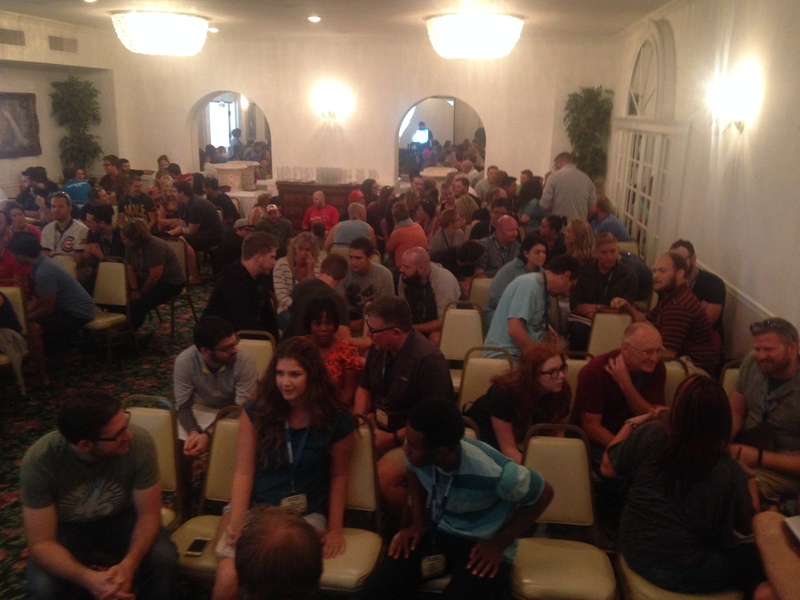 Last week was the Youth Specialties National Youth Workers Convention in San Diego, CA. On top of other responsibilities, I led the seminar entitled, Leading In Transition. How do I know it’s time to leave, and how do I do this well? How do I start strong in a new ministry? In the midst of change, how do we keep students the focus? I was blown away by the number of people who attended the seminar. Every chair was filled and a good number of others chose to stay and sit on the floor or cram the doorway. I think the highlight for me was at the end when a good 15-20 people stuck around to ask specific questions and/or ask for the notes. These private conversations led to many-an-email-address exchange and the opportunity to help scores of people outside the context of the convention. By my observation, the majority of the people were most interested in the things they need to prioritize as they start in ministry. I am blessed to be part of the YS family. What I did at NYWC I believe only scratches the surface of what I hope to do with churches as they partner with us for either YS Search or for YS Coaching. Because change is inevitable, we simply want to be an outside resource who can perhaps help provide perspective and insights! If you know of a church who we could help, please spread the word! I’d love to see you at the Louisville NYWC, where once again I’ll be part of the free coaching offerings and will be able lead the Leading In Transition seminar again! Get registered, November 19-22 in Louisville, KY!